Clockwise from top: Larry Doby and Jackie Robinson; Monte Irvin, Elston Howard, Minnie Minoso, and Ernie Banks. When Jackie Robinson debuted for the Brooklyn Dodgers at the start of the 1947 season it integrated Major League Baseball after several decades of exclusion for player’s of color. But even though Jackie’s act was historic, it also served as a beginning – a beginning of a new MLB landscape. Not every team had a black player in ’47, in fact only two of the other 15 clubs integrated that same year. 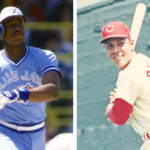 Here are the first black players for each of the 16 MLB teams of that era. 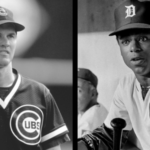 Some teams had more than one black player appear for the first time in the same game.